Get ready for the VIP treatment with the best Casino Cruise promotions and Bonuses! Casino Cruise is the place where even the wildest dreams are fulfilled through bonuses, generous promotions and once-in-a-lifetime offers. Just as the name suggests, this casino frequently sends players on all paid vacations and luxurious cruise ships around the world. It is these amazing rewards that make players feel special, while they play some of the best slots, table games and video pokers. The first and arguably the most generous of all Casino Cruise bonuses is the welcome package. A massive amount of $1000 and a complimentary bundle of 200 free spins are awarded to those who sign up for a real money account. The first deposit is doubled and players also receive the bonus rounds without having to enter a promotional code. Players who make the second deposit will be the happy recipients of a bonus worth 50% the amount of $200. 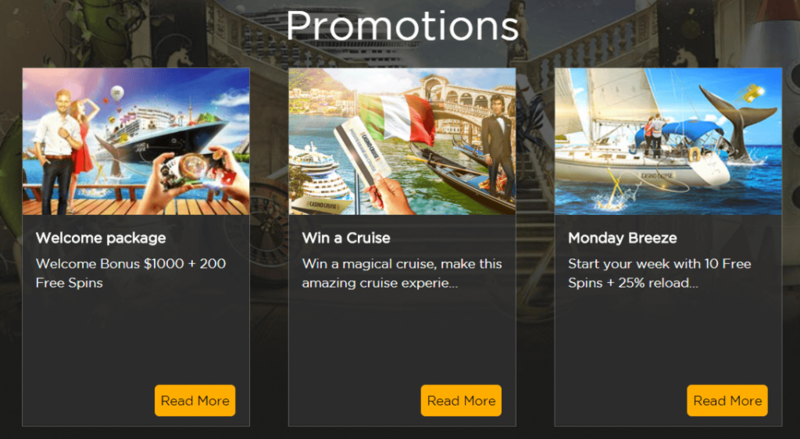 WCRUISE2 is the Casino Cruise bonus code needed to unlock the second deposit, while the third and fourth are also matched. This time players can only hope to receive 25% of their deposit but the upper limit is increased to $300. The bonus codes also changes and players need to enter WCRUISE3 and WCRUISE4 when making the deposit. 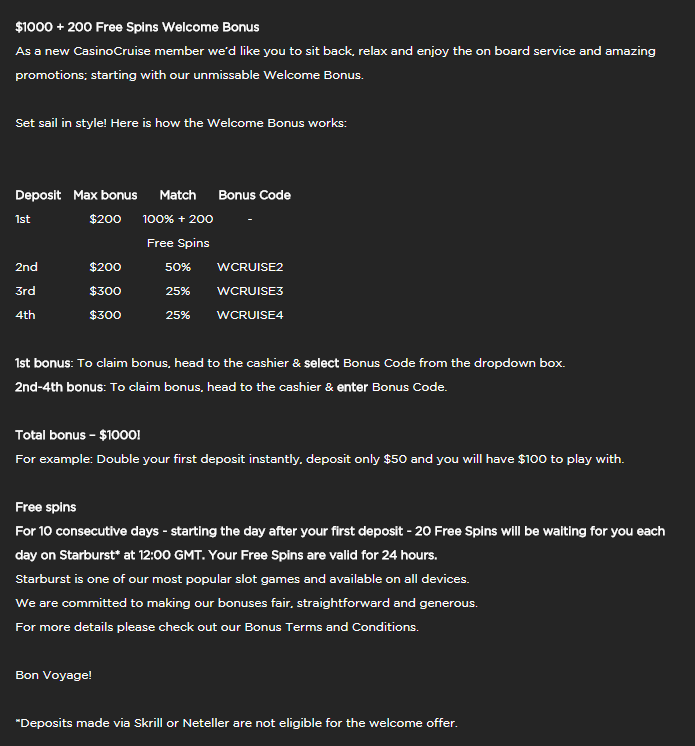 The 200 free spins are released incrementally in bundles of 20 at the time over the course of 10 consecutive days. They can be redeemed on the popular Starburst slot and are valid for 24 hours after they are awarded, so time is of the essence. Don’t waste a precious second and claim the free spins! On Tuesday, Join The Pool Party! There’s no Casino cruise bonus code to redeem when signing up for bonuses offered during the Tuesday Pool Party promotion. $100 in bonus cash is added to eligible players who deposit on Tuesday. They will have it matched by 25% and can use the money to play on Tuesday between 00:01 to 23:59. Wednesdays are also special and that’s because of the Monthly Splash Bonus Casino Cruise promotion. Once a month players can claim two other bonuses worth $100 each, when reloading their account. The casino will offer the reload bonus to all its members, including those that are actively involved in other promotions. Players only have 48 hours to claim the amazing Casino Cruise reload bonuses. Casino Cruise bonuses are also offered to the most dedicated players over a longer period of time. Cash points are used to reward the most active players whenever they log into their accounts to enjoy their games of choice. To accumulate one point, players only need to bet $20 on any games and the bigger the bets, the more points they collect. If you are wondering how to convert points to cash, know that they can be redeemed at a rate of 100 points for one dollar. Players can also win a cruise across the Mediterranean and other luxurious vacations throughout the year. While they get casino cruise bonuses each time they have the opportunity, gamblers should keep an eye on these exclusive offers. By opting in for this promotion they will receive a draw ticket each time they deposit and wager $50. The raffle will decide who wins the all paid vacations on the Mediterranean. CasinoCruise promotions of this magnitude are rare, but this is what makes them truly special. Those who win the vacation won’t have to worry about financial restraints as everything will be paid by the casino. Spending five nights aboard the luxurious ship sailing across the Mediterranean Sea is a memorable experience. Winners are notified by email and this channel of communication is also used by the casino to award other bonuses. Automatic Weekend Freebie is a shining example of such a generous offer.